March is women’s history month, and March 8 was International Women’s Day. To honor one of Arizona’s sheros, Senator Victoria Steele and I decided to jointly pay tribute in the Arizona Senate and House to Sister Clare Dunn, a Democratic representative from Tucson and a teacher at Salpointe Catholic High School. Why focus on Sister Clare? Because she was a fighter for women’s rights, for social justice, and for ratification of the Equal Rights Amendment (ERA). Both Steele and I have proposed ratification of the ERA several times, as did then State Senator Sandra Day (later Justice Sandra Day O’Connor) in 1972 and Sister Clare in 1975. When O’Connor proposed the ERA, it passed the Senate, but the House refused to hear it. When Dunn proposed it, the Republican establishment turned it into a circus, according to a recent article in the Arizona Daily Star. Dunn fired back with a lengthy rebuke of Republican dirty tricks and “horse and buggy” procedures to block the ERA. Rep. Joanne Osborne stood up first to pay tribute to the role of Arizona suffragette Frances Munds, the women authors for Out West magazine, and others had in Arizona statehood and the division of New Mexico and Arizona into two states. Unfortunately, Osborne’s speech also didn’t fit into the Republicans’ new three-minute time limit. Rep. T.J. Shope gavelled the end of her speech… in mid-sentence. Osborne seemed incredulous that Shope refused to let her finish her tribute. I sit two seats down from her, and said, “Give it to someone to finish.” She offered it to two Republican men who sit near us– Reps. Kevin Payne and Walter Blackman. Both refused. Tucson Democrat and gentleman, Rep. Domingo DeGrazia finished her speech. I was next with my tribute to Sister Clare. I had already tightened up my speech, but I knew it was about one minute too long. With all of the House Democrats standing behind me, Shope also gavelled me down mid-sentence while I was reading Sister Clare’s words. Peten picked up mid-sentence and read a few lines, but mysteriously, Peten’s microphone went dead while she was speaking. Shope said to try my mic, but it was also dead– although both microphones had been working just fine minutes earlier. Peten belted out the rest of the speech with no mic. Arizona Republicans honored Women’s History Month and International Women’s Day with disrespectful display of sexism and patriarchy at work. 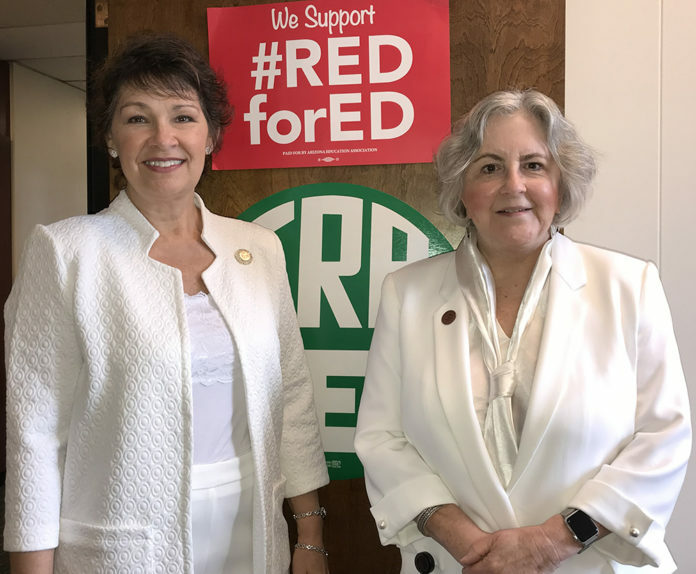 The scene– two women trying to pay tribute to important women leaders in Arizona history– and the leadership of the Arizona House can’t spare two extra minutes— one minute more for each tribute. Ironically, in her speech, Sister Clare railed against that same sexism and patriarchy in the Arizona House. Below is the somewhat longer version of my speech. If you want to read Sister Clare’s whole 1975 speech, go to the Star article here. Arizona House Democrats stand as Rep. Pam Powers Hannley reads a tribute to Sister Clare Dunn, who proposed the ERA in 1975 in the Arizona House. In honor of Women’s history month and International Women’s Day, Senator Victoria Steele and I are recognizing Justice Sandra Day O’Connor and Sister Clare Dunn for their contributions to Arizona history and to women’s history. The Equal Rights Amendment was introduced to Congress in 1923– 96 years ago. Congress finally passed the ERA in 1972 and sent it to the states for ratification. As many of you know, Republican State Senator Sandra Day, who later became Justice Sanda Day O’Corror, introduced the ERA in Arizona Senate in the early 1970s. What you may not know, is that the ERA was also proposed by Sister Clare Dunn, who was elected to the Arizona House of Representatives in 1974. Sister Dunn was the first Catholic nun ever elected to public office. Her constituents and her colleagues referred to as her “the conscience of the legislature.” Sister Dunn was a teacher at Sal Pointe Catholic High School in Tucson in LD9. Yes, a Catholic nun from Tucson proposed ratification of the ERA. I realize there are many people here who believe we should make a quick end to the “unimportant” issue so that we can proceed with real matters of the moment. They will no doubt find these remarks boring, unnecessary, futile, and repetitious. Nevertheless I offer them without apology, believing that in the endless struggle for human rights far too little has been said. Some apologies are in order, however. First, to the women of Arizona who have worked long and hard for this issue, I apologize for the shabby and belittling treatment given the Equal Rights Amendment by this body. To oppose a piece of legislation is one thing; to scornfully manipulate it through a series of torturous and ultimately face-saving maneuvers is quite another. The House of Representatives lived up to its reputation and chose the latter course. The situation is not totally unredeemed. Many citizens watched the process with astonishment and incredulity. They saw that the nefarious methods by which a serious piece of legislation could be manipulated were not only tolerable but quite orthodox under our horse-and-buggy procedures. 1) It should end the legitimation of discrimination and unequal protection under the law. 2) The ERA should help to end the deprecation of the feminist movement and the refusal to take seriously what may well be the most fundamental revolution in history. . . Tragically, Sister Dunn died in a car crash in 1981. Several of her friends and former students are in the Senate gallery today. Most of us ran for office to make a positive difference in the lives of Arizonans. The Equal Rights Amendment is that type of legacy legislation. Its impact goes far beyond the borders of Arizona. 161 million women nationwide are watching Arizona now – waiting for us to be the 38th state to ratify the ERA. In 1912, through the Citizens’ Initiative process, the voters of Arizona—who were all men back then– gave the women of Arizona the right to vote—long before women in the rest of the country could vote. Arizona stood up for women’s equality in 1912. Let’s take the next step and stand up for equal pay for equal work, for Constitutionally protected equal rights for women, and for ratification of the Equal Rights Amendment by the State of Arizona in 2019. Previous articleHas Democratic Phoenix Mayoral Candidate Daniel Valenzuela gone to the Republican Side?